Although often connected to minimalist sculptors such as Donald Judd, who also made simple painted wooden objects at roughly the same time, Anne Truitt had little in common with the anti-aesthetic and anti-compositional stance of that loosely defined movement. Rather, her epiphany came in 1961, when she first saw in person the paintings and sculptures of Barnett Newman and Ad Reinhardt. Like Newman, Truitt was committed to the expressive value of carefully chosen color and to the significance of compositional decisions regarding the division of the rectangle. Both qualities are evident in Knight's Heritage, an important transitional piece in which Truitt still employed a brushy texture to define the paint surface and actual grooves to mark the three divisions (elements she abandoned in her later, smoother work) but began to break out of the somber tones of her earliest work and embrace glowing color. The title has several possible references, including the popular 19th-century medieval fictions of Howard Pyle, which Truitt enjoyed, and the Kennedy administration ("Camelot"), which she admired and to which she had social connections. The simple frontal array of the work has a heraldic aspect that reinforces these associations. Born in Baltimore in 1921 and raised on the Eastern Shore of Maryland, Truitt settled in Washington, DC, in 1948 and remained in the region until her death in 2004. While the Gallery's collection includes two of her towering columnar works and one small horizontal piece from the 1970s, the addition of this major work from her breakthrough years establishes a more complete representation of this influential American sculptor's career. The artist [1921-2004]; her estate; (Matthew Marks Gallery, New York); purchased 12 May 2011 by NGA. 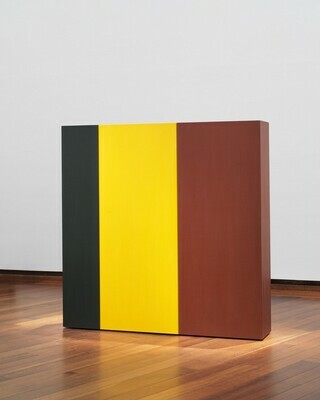 Anne Truitt, Retrospective: Sculpture and Works on Paper, Whitney Museum of American Art, New York, 1973-1974. Anne Truitt: Sculpture, Sheldon Memorial Art Gallery, University of Nebraska, Lincoln, 2003. In the Tower: Anne Truitt, National Gallery of Art, Washington, 2017-2018, unnumbered brochure, fig. 5. Hopps, Walter. Anne Truitt: Sculpture and Drawings 1961-1973. Washington, DC, 1974: no. 42, repro. Cooper, Harry. "In the Tower: Anne Truitt." National Gallery of Art Bulletin 56 (Spring 2017): 40-41, repro.